In common with many people, I hate Brussels sprouts. “Fairy Cabbages”? Bah. Hellspawned Junior Demon Cabbages, more like. Sure, they’re good for you: vitamins, iron, flavonoids, metabolites, woo-hoo! But to me they taste stale, like the distilled essence of kitchen wallpaper in an apartment where cabbage was cooked – and overcooked – every single day. By a depressed person. In the rain. But a number of years ago, my husband and I heard a radio broadcast in which someone described how to make these vile little torture-balls taste divine. And when we tried it, we agreed. Cook them this way, and they’re great. One of my favourite dishes. Even my son likes them. 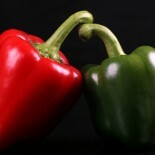 You’d never know they were the same vegetable. 1. Remove cores and outer leaves of Brussels sprouts; discard. Separate each Brussels sprout into individual leaves, or chop or shred sprouts. 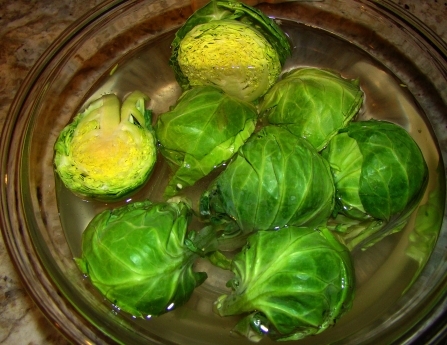 The cores are the part that give Brussels sprouts that disgusting stale-cabbage flavour, so get rid of them altogether. 2. Fry bacon in a skillet or wok until nearly done to your liking, then add onions and stir-fry in bacon fat until they’re transparent and browned. This will also complete the cooking of the bacon. 3. For the last 45 seconds or so of cooking, add Brussels sprout leaves and stir-fry until tender-crisp. I adore brussels sprouts! I always have, even when I hated most veggies. I called them “baby cabbages” when I was a kid. My current fave way to make them is to cut them in half top to bottom and roast them. You can toss in a little olive oil first if you like. Yum! I love brussels sprouts! But I know many do not…I just like them roasted/sauteed with butter 🙂 I will have to try them this way though. Thanks! This entry was posted on March 27, 2013 by thinkreadcook and tagged bacon, Brussels sprouts, cabbage, cooking, food, health, nutrition, onions, recipe, tasty.